Most Goldfish enthusiasts buy their fish from the local pet shop or, the much better option, a shop specializing only in aquarium fish. It continues to amaze me how often people make an impulse purchase of Goldfish, and then a few days later take to Facebook asking for advice because their fish are dying. We are all guilty of impulse purchases. I recently purchased the pair of Celestials above from my local aquarium fish store because I had been looking for this variety for some time. These fish were the right size, and were obviously rejects from a breeder as they both have minor faults, but their back profiles and eye development are good. The difference here is, I had bare cycled aquariums ready for quarantining any such purchases, plus I had the medications needed to treat parasites. Pet shops usually have a wide selection of pets, from puppies to parrots, Guinea Pigs to Goldfish. They are often run by young, inexperienced staff that can’t be expected to know any more than the basic care requirements for the range of animals they sell. The staff member that bagged up my fish asked me if I was going to put them in a pond, probably because at 85mm (3 3/8 inches) body length they were larger than the average Goldfish they usually offered for sale. Ponds aren’t really suitable for Celestials unless they are bare and relatively small, and only populated with Celestials or Water Bubble Eyes. No advice was offered concerning the care of this highly developed variety. 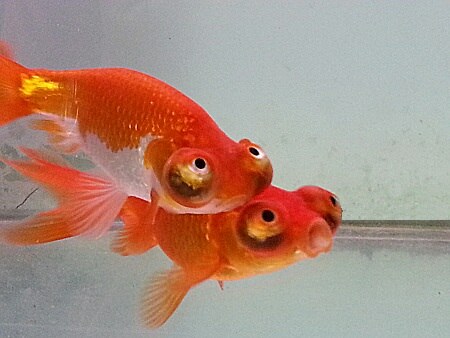 Because the "average" customer of a pet shop is not the knowledgeable Goldfish enthusiast you are, but someone who only knows a Goldfish as an orange/gold single tailed fish, pet shops mainly cater for this type of customer. You can’t blame them for that as their objective is to buy as cheaply as possible and sell quickly, and Comets fill that need. This results in a limited selection of perhaps 3 or 4 varieties being sold, usually Comets, Black Moor, Fantails and perhaps Shubunkins. The pet shop doesn’t want to spend too much on fish because of the high death rate, so they buy the cheapest available. The cheapest fish are also usually the lowest quality. Pet shops don’t make much money from Goldfish sales, it is the sale of aquariums, equipment, food and medications that make the most profits. Space is limited in any retail store, so the more stock you can cram into an area the better. For this reason, most aquariums are severely over-stocked with fish. The pet shop owners know this and the problems it causes, so to offset the overcrowding, they seldom, if at all, feed the fish. If no food is going into the water, very little waste is being produced. This means filters can easily cope with the large fish population, and water changes are minimized. My recently purchased Celestials were very under-weight. I didn’t realize how under-weight until after two months they have now got much deeper bodies. One thing that can’t be avoided is stress. Crowded fish are stressed fish, so any disease that is introduced into the aquarium is quickly passed on. This is why quarantining new fish bought from a pet shop isn’t a precaution, it’s a necessity. Buy from breeders if possible, or at least from a specialist aquarium fish store which is more likely to have a wider selection of varieties. Assume pet shop purchases have parasites, and treat accordingly with a praziquantel based medication. Adding a little aquarium or un-iodized cooking salt to the water will take care of any bacterial or fungal problems. Keep the water pristine. Feed fish from a pet shop sparingly and frequently for the first few weeks if they appear under-weight.